Nether Levens Hall lies about five and a half miles South of Kendal, just off the West bound slip road of the A590. The hall dominates the skyline as you travel East towards Kendal near the village of Levens, with its four tall Westmorland chimneys. Above. A view of the Southern end of the hall and the ruins. The site, but none of the remaining buildings, dates from around 1188, when the manor of Levens was divided into two parts: Over Levens (where Levens Hall is) and Nether Levens. 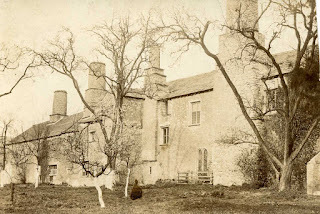 The division of the manor was overseen by Ketel, son of Elftred, who then sold Over Levens to Henry de Redeman whilst retaining Nether Levens as his home. Above. Another view of the Southern end of the hall and its ruins. 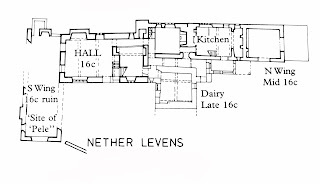 Nether Levens later passed by marriage to the Preston family. It is thought that the Prestons built a tower here, along with the courtyard and an earlier manor, sometime around the mid 15th century. A licence was granted around this time, for an oratory to be added to the complex of buildings, enabling the Preston family to attend private masses. Above. The Western aspect of the hall. The garde-robe can be seen to the left of the 2nd chimney from the right. Thomas Preston then rebuilt the medieval hall in 1594, as recorded by a date stone with the initials T.A.P. and the date 1594. 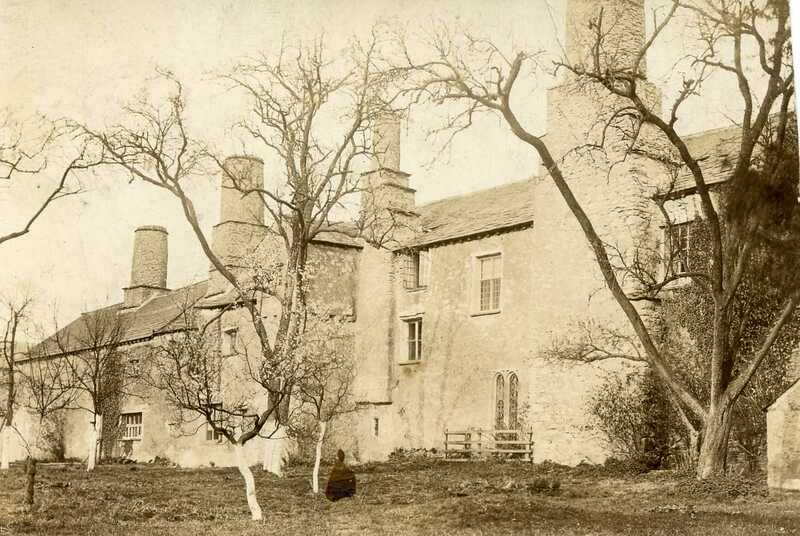 Over time the need for domestic protection was overtaken by the desire for comfort and luxury, and the tower, gatehouse and courtyard barmkyn were gradually swallowed up by further additions and rebuilding. The manor later passed to William, Viscount Montgomery, who later sold the estates to the Wilsons of Dallam Tower. Above. The last surviving portion of curtain wall to the West of the hall. The hall was originally surrounded by a curtain wall or barmkyn. Parts of this structure survive to the West of the hall, incorporated into a modern field wall.....but the greater, and more substantial part survives at the roadside to the East of the site. Here the wall and overgrown gatehouse still stand to around fifteen feet. At the South end of the courtyard, the 16th century hall stands amongst the ruins of outbuildings and the remains of walls. Above. The Eastern side of the courtyard wall. It is usually thought that the tower was sited at the Southern, now ruined end of the courtyard, where there are scant thin walled remains of a huge chimney breast and ten foot high portions of a gable wall. Above. Another view of the Eastern Side of the courtyard wall. However, Peter F. Ryder hypothesises that the tower was built to the West of the courtyard, and is now incorporated into the Western aspect of the hall, with the possibility that the small gabled out garde-robe that can be seen, represents part of the original tower. Above. The Southern end of the site, with the curtain wall to the left of the photo. Above. Old photo showing rear of the hall. Above. 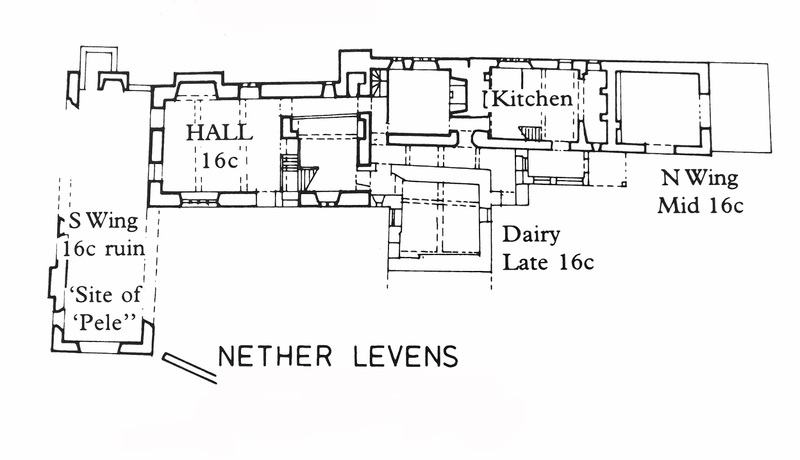 Floor plan of Nether Levens Hall. The form that Nether Levens took, ie; tower, hall, courtyard with a curtain wall, puts it firmly in the same group of fortifications as Burneside Hall, Preston Patrick Hall and Beetham Hall. To the West of the hall and its buildings, and just beyond the last remaining portion of curtain wall at this point, the field contains some curious earthworks. Above. The faint earthen platform to the South West of the hall. A large square raised earthen platform can be seen with evidence of buildings still remaining in places. These earthworks don't appear to have been investigated, but might represent the site of further buildings relating to the hall. Above. A view of the earthen platform, with a slight ditch to the right of the photo near the wall. The hall and its walls and remains can be seen from the roadside, and there are a few places where you can safely park to get some good views. This is amazing. From ancestry records my family owned the site during the 1800s which had been passed down for god knows how many generations previously.